Lead one of the seven great cities of the Ancient World. Exploit the natural resources of your lands, take part in the eternal march of progress, develop your commercial relationships and assert your military might. Leave your mark in the history of civilization by building an architectural marvel that will transcend the ages to come. 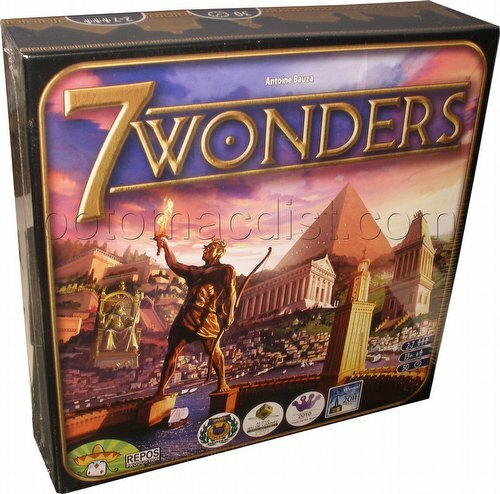 Includes 7 Wonder boards, 7 Wonder cards, 49 Age I cards, 49 Age II cards, 50 Age III cards, 46 Conflict tokens, 24 value 3 coins, 46 value 1 coins, 1 score booklet, 1 rulebook, and two "2 Player" cards. For 2-7 players ages 13 and up. 30 minutes playing time.